Has focus on NXE forced fans to wait? Fable 2 fans will be forced to wait an extra few days for what Lionhead has insisted is a 'big announcement' after Microsoft put its foot down on making any big splashes this week. However, a post on the official Fable 2 developers' blog states that Microsoft has asked for the announcement to be delayed – presumably so that it does not get lost in all the excitement over the NXE. "I know what you're thinking, but no, I'm afraid this is not the BIG news that got me (and most of you) so excited last week, writes Sam on the Blog. "The big bods over in Redmond decided that, this week wasn't the time to tell you what that announcement is we have ready here in Guildford. "However, there is some good news. 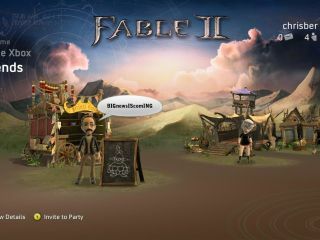 To celebrate the launch of the New Xbox Experience, we've created an all-new Fable II theme for your dashboard. Go show your Fable pride! "For those of you who are waiting for the "big one" - stay tuned, Microsoft assures me that we can announce it on Monday 24th. If not, I will fly over there and slam my fist on a desk. Like, really hard!" To be fair – with the Sugababes all set to 'push the button' (not our pun) on the avatar-based GUI termed NXE, it may well be better to hold off. Meanwhile – grab your Fable 2 theme while it's hot.